Southampton have signed striker Nicholas Bignall from Reading on a one-month loan deal. The 20-year-old is a product of the Royals' academy and has scored two goals in four appearances for the club. 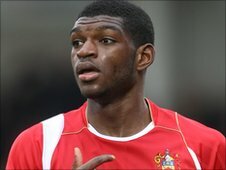 Since signing a professional deal in 2008, Bignall has spent time on loan at Northampton Town, Cheltenham Town and Stockport County. The forward goes straight into the squad to face Tranmere Rovers in League One on Saturday.